NEW YORK, De. 15, 2014 – It's the heart of the home, a gathering place for friends and family, especially during the holidays. As the most lived-in room in the house, the kitchen is usually the prime candidate for a renovation when home improvements come to mind. And while some homeowners may find a kitchen renovation intimidating, the personal and financial benefits make the commitment worthwhile. 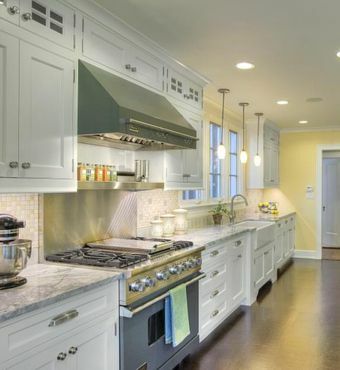 An Oak Park, Illinois, kitchen designed by Pamela Polvere, CKD, of Pamela Polvere Designs is elegant yet highly functional, thanks to elements like the GROHE LadyLux® Pro dual-spray, pull-down faucet with its tall, arched spout. “A kitchen renovation, done right, is a very sound investment," says Cheryl Dixon, Head of Brand and Trade Marketing for GROHE America, a division of Grohe AG, the world’s leading provider of sanitary fittings for kitchens and baths. "It can enhance family life, reduce energy costs and pay dividends at resale time.” While savings can vary according to the locale and market, a recent study by Remodeling.com estimates that a minor kitchen renovation of $18,856 adds $15,585 to a home’s resale value, recouping 82.7 percent of the initial investment. GROHE teamed up with award-winning designer Pamela Polvere, CKD, of Pamela Polvere Designs in Elmwood Park, outside Chicago, to provide these tips to help smoothly execute a kitchen renovation. “Planning is 95 percent of the project,” says Polvere. Do your homework. Look at magazines and decorating books, go to home shows, visit showrooms in your area and go online for the latest information on trends and new technology. Use the Internet and social media sites to research designers and contractors to find out their specialties and see examples of their work as well as feedback from clients. “It’s wise to not only research the contractors you will be using but to determine what your rights and obligations will be throughout the process,” Polvere advises. For example, contractors hire sub-contractors to do much of the work. Be sure that you are not responsible for paying these sub-contractors as you can be held accountable should the contractor fail to do so. The GROHE K7® Semi Pro faucet offers a flexible pull-out spray, 360-degree swivel arm and one-hand operation for ultimate ease of use. No place is the marriage of functionality and convenience more important than in the kitchen. When choosing a faucet, for example, it’s important to consider spout height, reach and features, like pull-out sprays or touch technology. 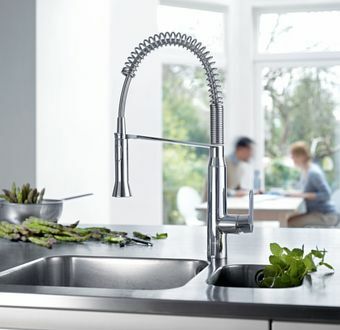 The GROHE K7® Semi Pro faucet offers a flexible pull-out spray, 360-degree swivel arm and one-hand operation for ultimate ease of use, as well as the SpeedClean® anti-lime system, standard on most GROHE kitchen faucets. To upgrade the functionality and improve the overall appeal of your kitchen, also consider faucets with touch technology. The GROHE LadyLux3 Café Touch provides the convenience of a touch faucet with a pull-out spray. With its innovative EasyTouch technology, the LadyLux3 Café Touch faucet allows family members to easily turn the faucet on and off with a simple touch of the spout using wrists or elbows. Faucets made with a solid metal foundation of brass, stainless steel, or copper will provide durability and beauty for years to come. All GROHE products are made with the highest quality materials and equipped with a limited lifetime warranty on finishes, making GROHE faucets a wise investment. A kitchen’s cabinets are an important focal point as they take up much of the room and are the first things one sees on entering. After choosing your cabinets, make sure appliances and fittings and fixtures complement each other in terms of color, texture and metal finishes. A brushed metal finish, like GROHE Starlight Chrome® in precious matte, for example, coordinates with most décor schemes. Following the cabinets, selecting a countertop that suits both your design and practical needs is equally as important. In addition to granite, marble and concrete countertops, quartz is becoming a popular option. “More are turning to newer quartz countertops that have the look of marble, but not the high maintenance,” notes Polvere. Select tiles and wall colors last. Once the other elements are in place, choose a tile for the backsplash that will complement them and then pull a color from that for the walls, says Polvere. White works best as a trim, especially with gray, a color that’s now trending as a new neutral. Or, choose a wall color and trim from one of the “affinity colors” already coordinated by some of the top paint manufacturers. There are three types of lighting: ambient lighting, which comes from ceiling lights and wall-mounted lights; accent lighting, which draws attention to a particular feature in a room; and task lighting, such as pendants and under-counter lights. “Pendant lights are used to great effect in today’s kitchens, usually grouped in two’s or three’s,” advises Polvere. LED lights save energy and add to a kitchen’s safety and comfort. “They give off less heat, great light and last forever,” says Polvere. GROHE Blue® Chilled & Sparkling combines the modern look of a designer faucet with a high-performance filter, cooler and carbonator – and is as easy to use as an ordinary kitchen faucet. A kitchen renovation is an opportunity to dramatically alter a home’s carbon footprint and to realize long-term savings. New technology is constantly evolving and homeowners can achieve significant savings in energy costs as well as local and federal tax initiatives. In the kitchen, GROHE Blue® Chilled & Sparkling eliminates the need to buy bottled water, and to dispose of plastic waste. GROHE Blue® Chilled & Sparkling combines a sleek designer faucet with a high-performance filter, cooler and carbonator to provide fresh, cooled and filtered flat or sparkling water free of impurities right from the faucet. Use the right lever on the faucet to mix to mix hot and cold tap water. Turn the left handle once for flat water, and those who prefer a little – or a lot – of sparkle in their water can choose from twin sparkling water settings. GROHE is also proud to offer a range of products that are fully compliant with CALGreen, California's Green Building Standards, a landmark initiative mandating sustainability and conservation measures in new construction projects, requiring all new buildings to reduce indoor water usage by 20 percent. “More than any other renovation, a well-planned, efficient and aesthetically pleasing kitchen can be an investment in a family’s quality of life and a warm, welcoming and beautiful place to gather,” concludes Dixon. 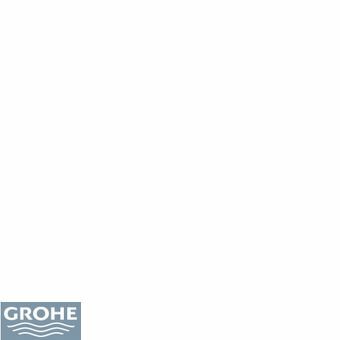 GROHE faucet and shower products are distributed in more than 180 countries and represent nearly 80 years of excellence in European design, innovation, engineering and quality. GROHE America’s headquarters are in the heart of the Flatiron district and houses the GROHE Live! Center, an interactive showroom created for inspiration and collaboration.